Are you ready to commence work en pointe? Perhaps one of the most exciting times in a young dancers life is when she puts on her first pair of pointe shoes. The excitement and trepidation of making the transition from demi-pointe to pointe is incredibly exciting, however without guidance, this transition may just result in failure for the body to cope. Before this transition, a pre-pointe assessment will help to identify a number of critical factors; is the dancer physically ready? Do they have any pre-existing injuries that might pose a risk? And do they have the specific skills necessary to manage work en pointe? Why is working en pointe different to demi pointe? Dancers are often surprised at how different it is rising en pointe rather than demi-pointe. Firstly the biomechanics of the foot change. The necessary strength through the forefoot, specifically the intrinsic muscles of the foot and the calf muscle is considerably greater in order to rise from demi-pointe to pointe. The muscles in the foot and ankle must also be able to work in a much greater range of motion en pointe rather than on demi pointe in order to achieve the correct angles necessary to efficiently control the centre of gravity on the pointe shoe. Additionally, the surface area and resistance between the shoe and the ground is much less en pointe. This means that balance and stability en pointe is much less than demi-pointe, and therefore the ability to control turn out is much more challenging. Therefore, the dancer needs to have sufficient balance, core strength and turnout control. How to know whether you are ready to commence work en pointe? Usually your dance teacher will be the first person to suggest that you are approaching the time to consider pointe work. However, most dance teachers and dance professionals recommend that you be assessed by a clinician prior to commencing pointe work in order to reduce injury risk and make the transition en pointe as safe and smooth as possible. 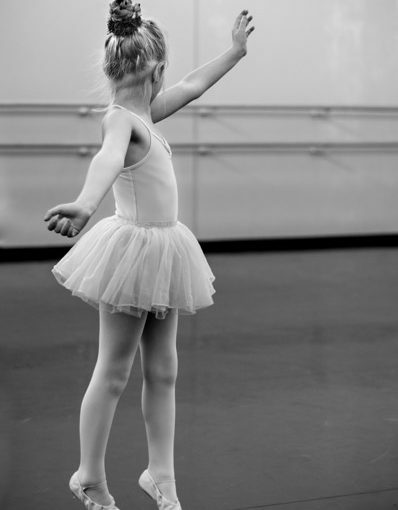 A pre-pointe assessment by an experienced dance physiotherapist will clearly ascertain whether you are ready to commence pointe work, as well as highlight the key areas that may need improvement. The clinician can then prescribe the necessary interventions to address the dancers limitations in order to improve them sufficiently and progress the dancer to pointe. What are some of the indicators necessary to be ready for pointe work? What happens after my pre-pointe assessment? Your dance physiotherapist will advise you whether you are ready to commence pointe work at the end of your assessment. It is common for dancers to not be yet ready to commence pointe work when they present for their first assessment, and the therapist clearly outline to you why this may be the case. Each limitation will be addressed with appropriate treatment or home exercises, in order to correct the issue. An estimated time frame for improvement and re-assessment scheduled if necessary. A report outlining the assessment findings is sent to yourself and to your dance teacher if consented by you. Already dancing en pointe but having issues? A pointe assessment can be extremely beneficial for the dancer who is already dancing en pointe but is perhaps having some difficulty or would like to brush up on their skills. Our experienced dance physiotherapist can discover strengths and weaknesses to give the dancer more awareness of their own body and improve dance experience and performance. Our Commitment to you - At Malvern Physiotherapy Clinic it is our commitment to provide you with expert care and attention from when you first see our therapists until your injury/concern is fully resolved. Please have a look at our Customer Service Charter for more information.